Although the enthusiasm surrounding blockchain technology has waned, the infrastructure behind bitcoin’s notable rise (and fall) in recent years still presents a compelling case to securely authenticate the exchange of valuable assets. A blockchain essentially consists of records (“blocks”) that are inextricably linked and secured (into the “chain”) using cryptography. These records exist via a distributed ledger system that creates an open-source, decentralised mechanism for exchanging all types of information and transfers of value. The data on the blockchain is transparently validated by consensus (there are no intermediaries). This data, once stored, cannot be modified or deleted. A digital protocol that can verify, facilitate and enforce the performance of a contract regardless of its complexity. Using mathematically complex algorithms, all aspects of a contract can be made partly or fully self-executing when specific conditions are met. No one party controls the contract, yet all parties can trust it. Arguably, therefore, smart contracts provide superior security levels relative to traditional contract law execution. Proponents also argue that costs are significantly reduced. Today, conveyancing is heavily fragmented, inefficient and involves archaic verification processes to assure legitimacy. From identity checks, fittings / contents / property information forms and deed history examinations through to surveys, mortgage confirmations / discharges, seller enquiries and contract drafting, few would deny that the entire process is a bureaucratic haze. Property title fraud alone costs the Land Registry approximately £10 million in indemnifying homeowners on an annual basis. How Can Blockchain Be Used in the UK Property Industry? The implementation of blockchain architecture means that the chronological stages of the conveyancing and property registration processes can occur within milliseconds. Referred to as “triple entry bookkeeping”, smart contracts written in software code effectively form part of a Decentralised Autonomous Organisation (DAO). Once a transaction is agreed, it is sent to a public ledger (or network) that operates on a peer-to-peer, open-sourced basis via multiple servers / computers known as nodes. Each transaction within the network is characterised by a unique digital ID “block” after all information related to transferring the title, deed and associated contract(s) are validated. Once this process is complete, the data “blocks” are permanently placed onto the “chain” and the transaction is complete. An unforgeable, time-stamped digital signature is produced and the integrity of the transaction is guaranteed. This sequential process is undertaken without the need for third party or authoritative permissions. 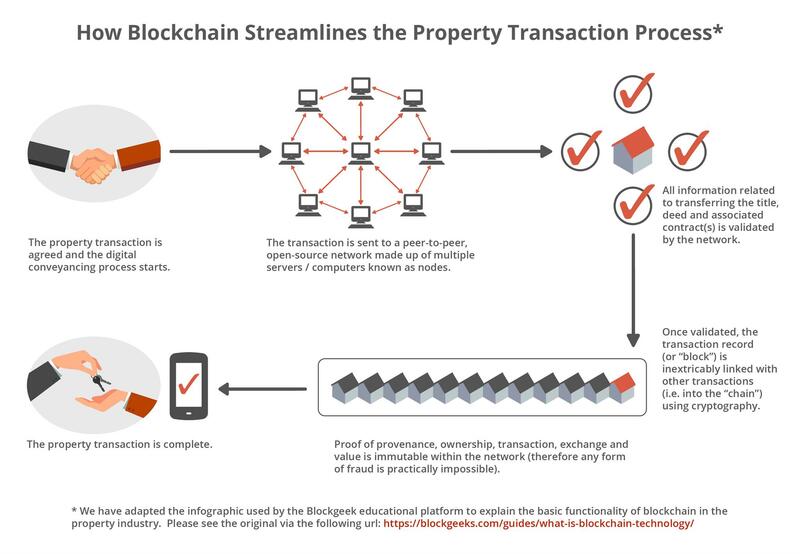 In the property industry specifically, the blockchain functions as an immutable ledger where all deeds, mortgage information, property / land records and associated data are expedited much quicker and, upon the transaction’s conclusion, held perpetually. Previous Anti-Money Laundering (AML) / Know Your Customer (KYC) checks. This unique digital property data package (analogous to a cloud-hosted wallet that replaces a paper deed / title) is fully secured and encrypted. Hashes identify every transaction and the process does not require any manual intervention due to being pre-empted, self-authenticated, drafted using smart contractual stipulations and policed by the very nature of the cryptography. At the point of transfer, the seller would rehash (encrypt) the digital file to prove possession. This ensures that the passage of title between the seller (grantor) and buyer (grantee) is transparently executed. It is also possible to activate certain actions automatically, such as the instantaneous payment of stamp duty (integrating blockchain protocols into those at the HM Revenue and Customs) and any sales fees due at completion). The new owner is then identified using “public key cryptography”, analogous to a digital DNA. Proof of provenance, ownership, transaction, exchange and value can never be changed within the network. Therefore, by the impossibility of tampering with the cryptographically secure smart contract structure, even though fraudsters may digitally replicate the files, breaking the code would only occur when they have direct control of the keys and when all distributed copies of the ledger are hacked simultaneously (a practically impossible feat). Furthermore, proponents argue that digital “oracles” or specific application programming interfaces (APIs) can monitor the progress of each of the steps to ensure the enforceability and unbreakability of the contract. In addition to massively reducing the routine administrative load, that are often susceptible to human error, these protocols also remove the need for title insurance and other preventative measures against fraud or other forms of cyber-crime. Legal auditing, to a certain degree, is also minimised and any contractual alterations can be recorded with negligible risk of future disputes. Integration with Building Information Modelling protocols (procurement, designs, previous planning applications). As part of the 2017 Annual Report and Accounts, the HM Land Registry set out its vision for an “ambitious digital transformation towards becoming the world’s leading land registry for speed, simplicity and an open approach to data”. The objective is for “property to be changed instantaneously” and for the public database to hold more granular data through underlying blockchain protocols. To date, the technology has been used to enable better collaborative work of government agencies on the UK border and, more relevantly, working with the private sector on the “Digital Street” initiative. Graham Farrant, chief executive and chief land registrar at the HMLR reported on testing the Sign Your Mortgage Deed service for remortgaging homeowners. The mortgage deed will be produced and signed as part of a largely disintermediated digital conveyance process legitimately recorded at the Land Registry. Identity assurance will be provided by the GOV.UK Verify service. Whilst not removing the well-recognised political ambiguity, blockchain also has the potential to create much-needed efficiencies in the planning system. For example, sequential “tick box” (if/then) principles can potentially form standardised meta processes – subsequently applicable to a range of key local planning authority decisions (without the need for administrative middlemen). The Japanese government will initiate trials of processing property transactions in key cities onto the blockchain in summer 2018. It would be premature to conclusively define blockchain’s role in the property. However, as the research and experimentation continue, the embryonic technology clearly has an important role to play moving forward. Administrative time and cost savings, a more transparent due diligence process, fewer incidences of title fraud and other risks that often jeopardise the security of sale will all appeal to investors and developers alike. As seen above, the application of the technology across the fast-growing peer-to-peer business models is also particularly interesting. Playing devil’s advocate, it is worth highlighting that although technologies such as Artificial Intelligence will work complementarily with blockchain protocols, a perfectly executed digital conveyance can still be scuppered by credit, survey and other financing requirements. Mainstream take-up of the technology will also demand a huge amount of computer processing power and energy use. As a result, although the associated costs may well reduce with scalability, fully operational blockchain registries and models will take time to build. For instance, for every country there will be a massive challenge to accurately and securely transfer all land registry data into the blockchain. The technology offers no recourse for the unreliability of the data contained within it. Therefore, should erroneous transaction information be inputted from the outset, the network will still confirm its authenticity and accept any future exchanges provided the correct protocols are adhered to. This latter issue could be particularly problematic in non-advanced economies where corruption is endemic, and deeds are scattered across different areas of jurisdiction. This would, therefore, be the responsibility of governments to develop legally-compliant systems that agree what information can and cannot be entered into the blockchain. Lawyers reading this may also wonder how they will be affected. The speed and efficiency of the indelibly legally binding smart contracts may render the more administrative aspects of the profession obsolete. 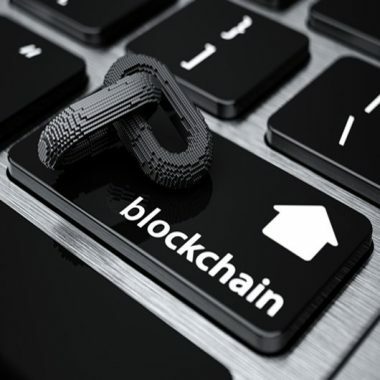 Should blockchain gain the traction that its proponents imagine, there is an argument that the lawyers of the future would perhaps take on more of a supervisory role – monitoring compliance, analysing intellectually demanding points of law, dealing with the more face-to-face side of the conveyancing process for example. Inevitably, legal structures will also need to adapt particularly around questions of data protection and security. In the UK, beyond compliance with anti-money laundering regulations, today there are very few government regulations and laws surrounding the use of blockchain. Bodies such as the Law Society and the Financial Conduct Authority will have to ascertain how blockchain transactions are monitored. The FCA is adopting a “wait and see” approach, although has reportedly been communicating with regulators in other jurisdictions. This post has merely touched on a topic that looks set to gain significant traction and debate in the coming years. As blockchain inevitably continues to mature, it will certainly be interesting to watch how its adoption into the property industry takes shape. Cryptography can be defined as the science and application of protecting information by transforming it into formats unrecognisable to unauthorised users. Digital data that is replicated, synchronised and consensually shared across a large network. For excellent explanations of blockchain over-arching principles, see Coindesk’s What is Blockchain Technology?, Hackernoon’s WTF is The Blockchain?, Blockgeek’s What is Blockchain Technology?, a BBC Newsnight Report on Blockchain, Nick Szabo’s Money, Blockchain and Social Scalability, Practical Law’s Blockchain Technology: Emerging from the Shadows and Bettina Warburg’s TED talk on How the Blockchain will Radically Transform the Economy. An article entitled: What is Ethereum? Everything You Need to Know About Ethereum, Explained also contains interesting insights. A useful analogy used by The Spectator magazine was as a “giant public spreadsheet” where all parties in a transaction can see what is happening and make changes based on actions they have taken or transactions they have completed. Once certain cells in the spreadsheet are filled, a contract is automatically generated. An enhancement to the traditional double-entry bookkeeping concept, whereby any entry into a transactional record is additionally and cryptographically sealed by a third party. See this useful explanatory YouTube video as well as this article via Blockgeeks which provides a solid explanation of Ethereum, the technology that enables developers to build and deploy applications such Decentralised Autonomous Organisations. The number of nodes within a blockchain network can be anything from the hundreds to the tens of thousands. Monitoring the creation and future modification times of a document. Key points of a property transaction’s history can be accurately “replayed” meaning that the chain of ownership is uninterrupted by external factors. Each transaction (block) is encoded and sent to all the network in the form of a long string of characters in the form of a hash. For the transaction to be valid, the first character set of the new hash needs to be the same as the last character of the preceding hash. The network must verify the validity of the block (transaction record) for it to be added to the chain. See the PwC report: How blockchain technology could improve the tax system. A set of characters based on complex mathematics. See this article by Dave Hughes, construction consultant: The impact of blockchain technology on the construction industry. See this article by Ronan O’Boyle of Urban Intelligence: Block capital – How blockchain could change planning. See the company’s whitepaper: BitProperty: A Platform for Tradeable and Liquid Real Estate. The storage of personal and business identity data on devices that can be used across daily transactions (for claims, proofs and attestations) without relying on central databases. See an interesting report on using blockchain as a technical solution for real estate transaction here. In January 2016 the Government Office for Science published Distributed Ledger Technology: Beyond Blockchain which set out the benefits of using the technology and recommends widespread integration.